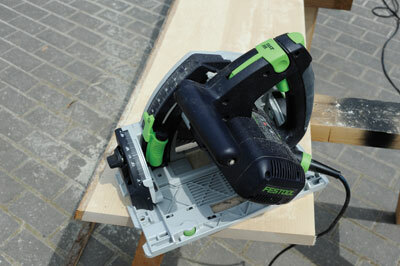 The TS 55 is responsible for converting more new users of Festool power tools to become life-long devotees of the brand. Don't think for a second that it's an entry level machine - a safer and more intuitive circular/plunge saw is hard to find if you are contemplating this type of machine for the first time. Guiderails have significantly transformed the way we use circular saws and choosing a good one will get you close to shop accuracy on site. Developments in blade technology and the increased use of hand-held machines means there's a greater choice of blades for cutting a wider range of materials, including laminated boards and aluminium. 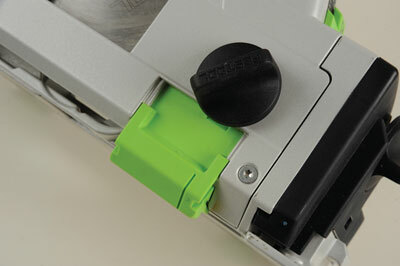 With the TS 55R, Festool have taken things a stage further with a body designed to completely enclose the blade. Other plunge saws will retract into the body but nothing like the TS 55R. What makes it special is that the flat face enables cuts to be made less than 10mm away from a wall or upstand. The internal chamber has been redesigned to alter airflow and therefore has extraction to match the earlier model. An automatically retracting riving knife enables you to locate accurately into an existing cut line to resume the cut. The second significant upgrade for the new model is a dual scale for setting and reading the depth of cut from either a guide track (50mm) or straight from the surface of the material (55mm). The mechanism includes a system for calibrating this to within less than 0.5mm - at last a scale on a circular saw that is more than just a rough guide. Bevel cuts are achieved from -1°-47°. The over/under cut is only permissible after unlocking a restricting pin to prevent the user from accidentally setting these angles. There will always be times when you need to site the cutting edge and with the TS 55R this can be done from either side. Exchange the clear plastic observation shield and replace it with the splinter guard and you can make some very acceptable cuts in faced sheet material. With such an important product as the TS 55 in their range, Festool have worked hard to upgrade what was already a tried and tested machine, so things like the 1,200W motor and cutting capacity remain unchanged. 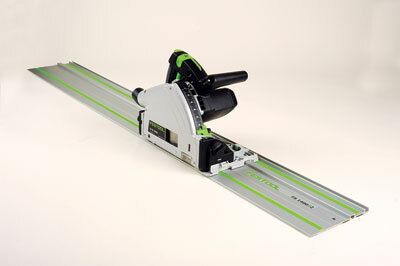 Similarly all your existing blades will fit the new model and integrate with the existing range of Festool tablesaw accessories. I'm glad they haven't tinkered around with the overall body shape too much; some compact machines can feel a little awkward and unbalanced when the fore and aft grips are too close together. The TS 55R is a good combination of size and capacity. 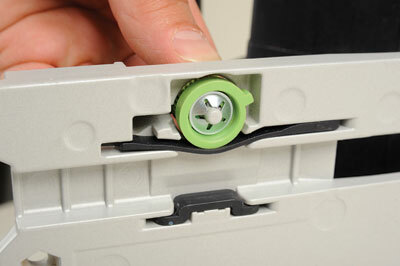 As systems go this one from Festool is about the most convincing one you will find out there, and whether you choose to use it with the guide track or mounted in a table, the build quality will ensure you will not be replacing it any time soon. Be sure to register your warranty online after purchasing to extend the period from one to three years, at no extra cost. Doing so automatically covers you for theft where, for a standard excess of £100 per tool, Festool will replace a stolen machine with a brand new one.